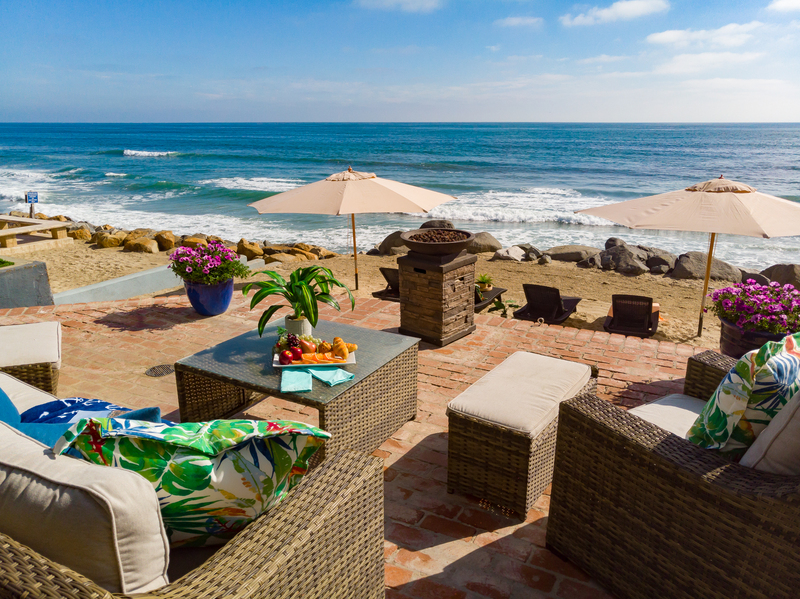 This NEWLY REMODELED Private Oceanfront Home is the first of its' kind. Perfect for a great family reunion or a corporate retreat, this massive 4 level, 8-bedroom house includes new appliances, a fresh layout, and panoramic doors. Upon entering the street level of the complex, there is a large kitchen featuring both a bar top and dining table to eat at. In addition, there is also a quaint breakfast nook. 2 bedrooms lay on this level, each with their OWN bathroom. 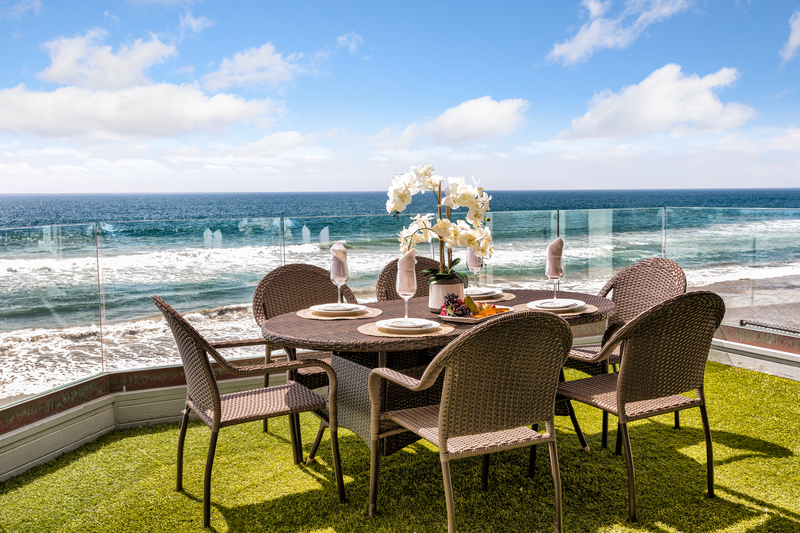 Right outside the living space, is your own private deck, which allows you to overlook the gorgeous Pacific Ocean. 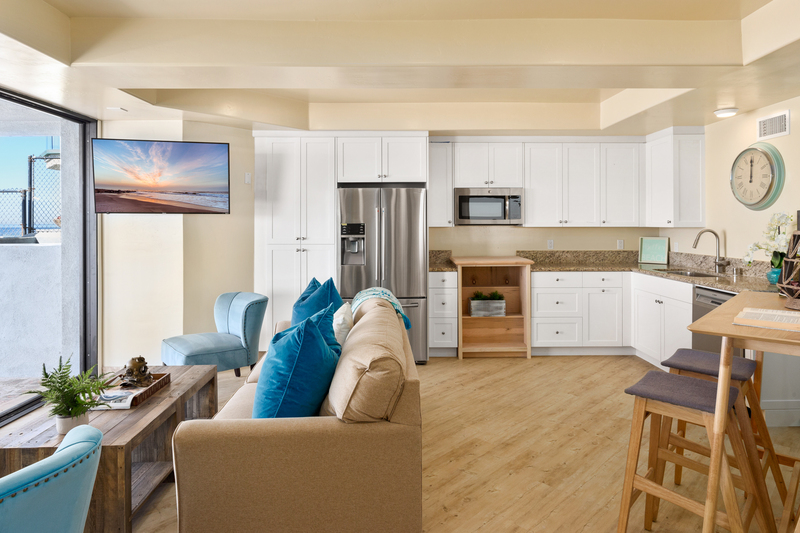 As you step down to the 1st level/beach level, you are met with yet another kitchen and living space, along with 2 more additional bedrooms. The view right outside the living space is beyond spectacular. 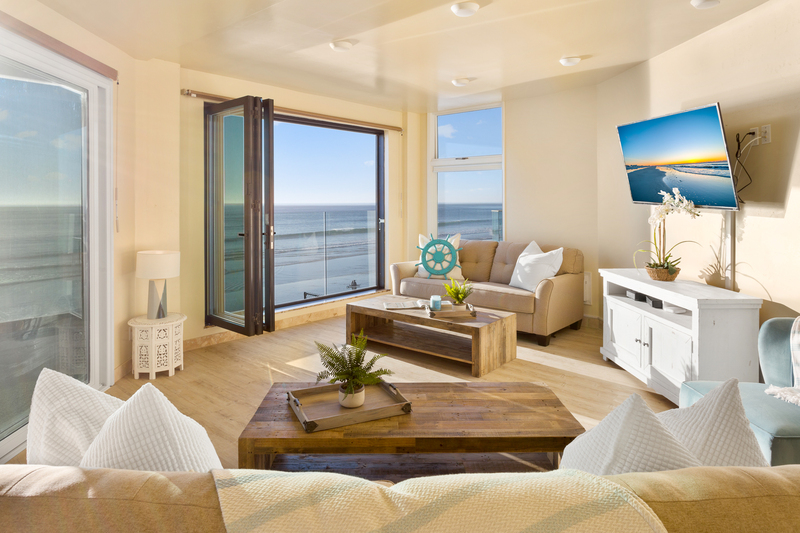 Panoramic doors open up and allow you direct access to the beach. 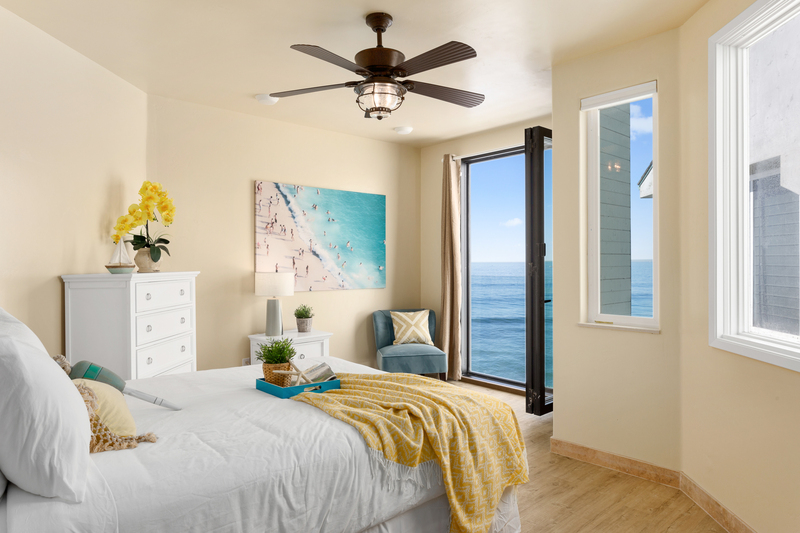 Great for airflow, panoramic doors also allow guests to control how much of a breeze comes and what may or may not obstruct your perfect view of the beach. Want to feel the ocean breeze and the sea mist hit your face? No problem, just pop open 1 or more of your panoramic door panels. 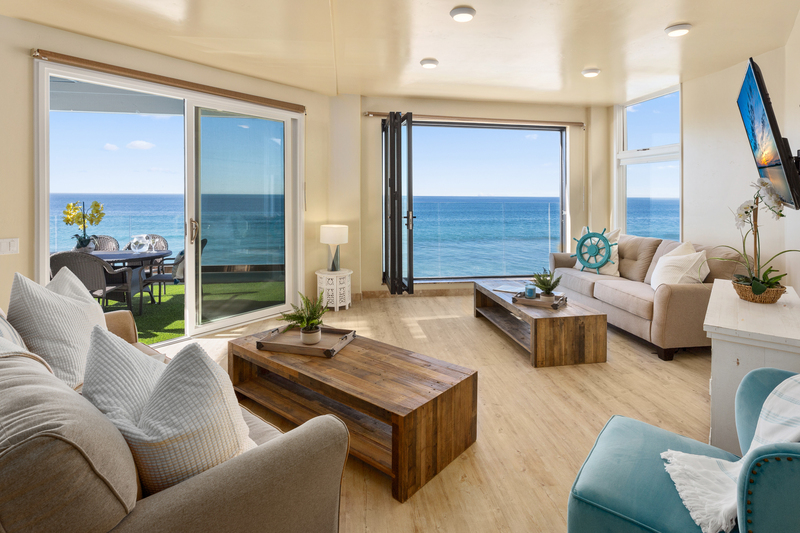 If you stroll up to 3rd/upper level of the unit, there are 4 more bedrooms present, with a majority of them having fantastic ocean views. This level also has its' own private deck, allowing guests to enjoy their morning coffee or late afternoon beer while lounging outside and gazing upon the sunrise or sunset. Last, but not least, tenants can take stairs up to the rooftop deck. 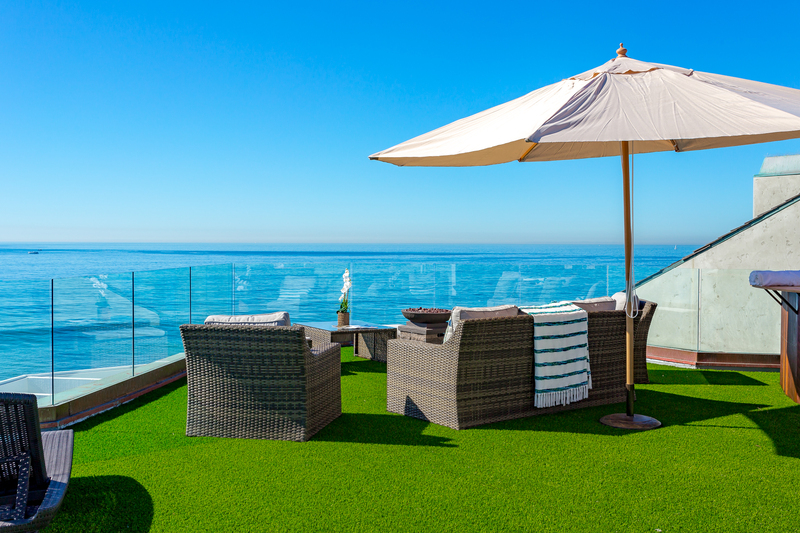 The rooftop deck has been newly renovated with artificial grass, allowing people to lay down comfortably and soak in the sun, as opposed to being on cold, hard concrete. Additional parking is available at our office in Oceanside, located at 1640 Oceanside Blvd, Oceanside, CA 92054. Our stay was absolutely amazing - the house was huge and fit all 28 of us. The roof deck is hands down the best part and we spent the majority of our stay soaking up the sun up there. Would most definitely book again! Finding the property was smooth; checking in was smooth. Picking the bedroom difficult...they were all amazing with there own attributes. Everything we needed was there. A quick trip to the local stores and we were all set! The property is located in a quiet neighborhood, just the sounds of the sea. Rooftop desk with jacuzzi and gas fire ring was awesome!!! The cafe lights at night was a nice touch. I can’t say enough about Beach Front Only. We were beach front. This home is spectacular. 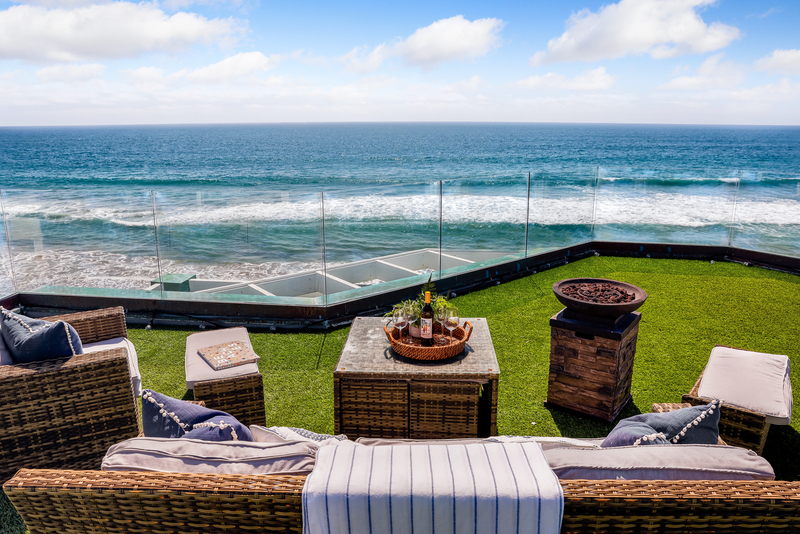 The ocean views from the main floor and rooftop are well worth the premium price paid for the house. The house was equipped with everything we could think of - ping pong and pool table for the kids, kitchen stocked to prepare meals for 18 people, washer/dryer on all 3 floors, sand toys for the beach in front, enough towels, blankets, pillows. Our family of 18 had a wonderful time and I would highly recommend this place. The only downside of the location was you could not really walk along the beach or play at the beach given the waves come right up to the rocks in front of the house. Property management was responsive - when I discovered the rooftop spa wasn't warm when we arrived, it was quickly fixed the next day when we called. I'd recommend adding this check to the checklist before guests arrive to avoid a maintenance request. This Beachfront property was the perfect spot for all 30 of our family to celebrate my mother's 90th birthday! Gorgeous views right from the house (! ), clean, space to spread out, and it had everything provided that we should need. I was very surprised at how much room we had and we didn't feel like we were on top of each other. We even joked that we had to text people to find out where in the house they were because it was so big we couldn't find them! The two hot tubs were an added bonus. The rooftop was probably everyone's favorite place to hang out, lay in the sun, watch the sunset, and relax. The proximity to restaurants, the Pier, shopping and beach spots was perfect. Lots of street parking so we had no problem finding spots for all of our cars in addition to the three spots provided. Plenty of towels and bedding provided. Kitchen was nicely stocked with all that we needed including three coffee pots! I can't say enough how much every single person loved this place and we were sad to leave when the week was up. I hope we can come back someday! Honestly don't even need to get into it. Picture's showed it perfectly. It felt private. We had a wonderful time. My entire experience was amazing! As we started planning for the family weekend, finding the perfect pace to stay was my first task. The staff at Beach front were extremely helpful! I asked dozens of questions and requested quite a bit of information regarding the neighborhood and proximity to certain amenities. 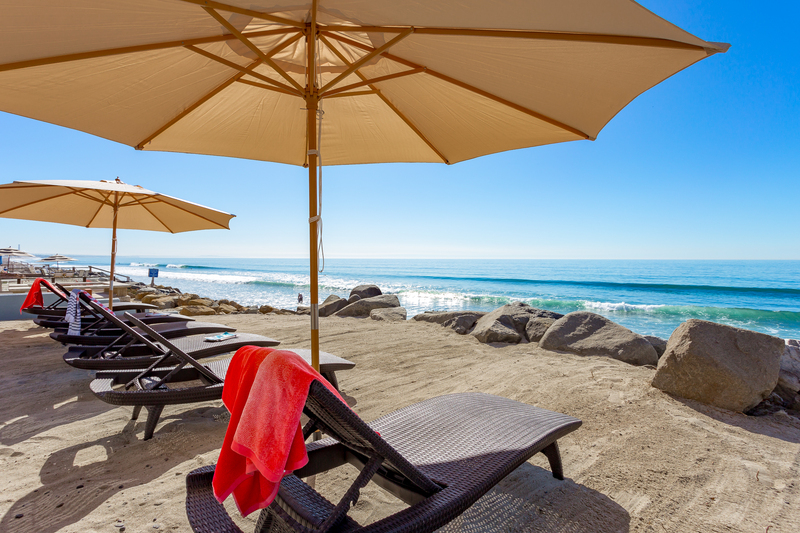 The Beachfront team always responded quickly and were consistently positive. The house was perfect. There were 18 of us total and there was enough space for us to be cozy but still space to spread out. The place was spotless and overall condition was very well maintained. The location was close enough to the pier, shopping and public beaches, but still in a quiet neighborhood. The property was well stocked and had every thing (plus some) that we needed to cook for all of us. My only comment for improvement would be to possibly have a bigger coffee pot. One of my concerns was access to the beach. No need to worry! There was plenty of low tide time right outside the door, and the public beach was just steps away. My family flew in to San Diego and took the coaster train to Oceanside station which was just 5 minute drive from the house. I can not say enough good about our experience and the staff at Beach Front! I would stay here again and strongly recommend to my friends. Thank you! 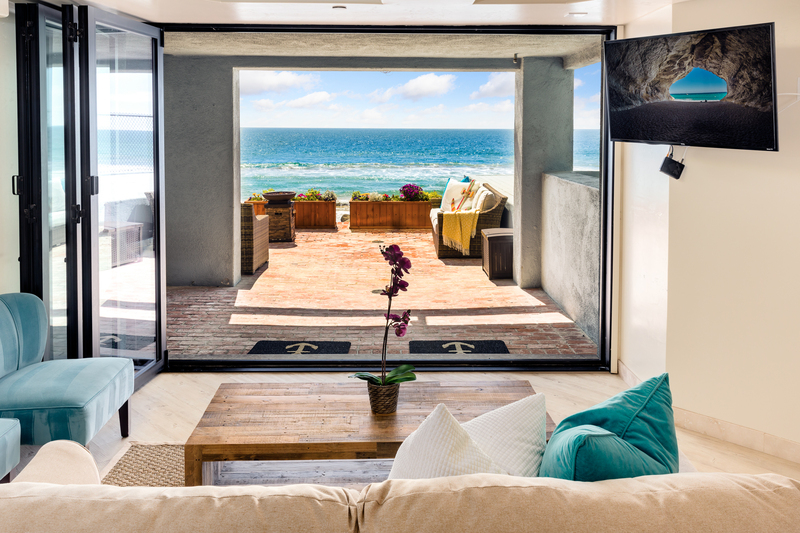 We LOVED this beach house! It was clean, spacious, and had everything we needed. The layout is great with lots of open space for large gatherings and plenty of beds to sleep everyone. All linens and kitchenware were provided. All we had to bring was food! 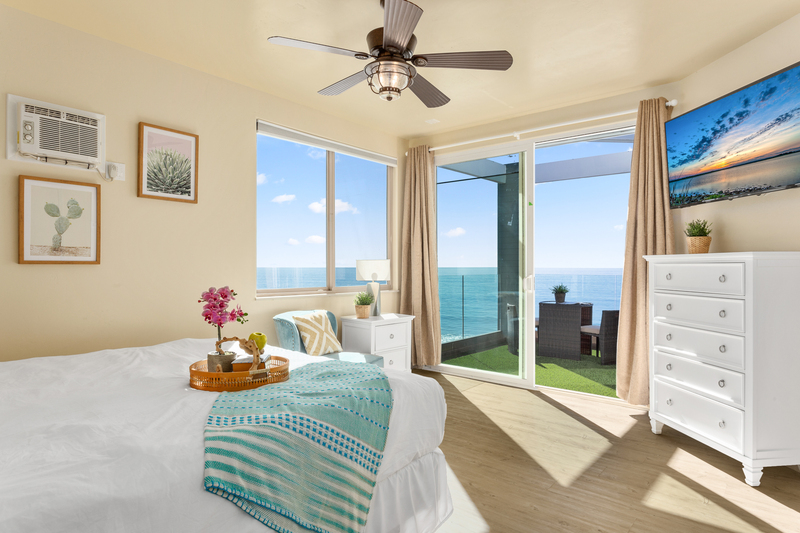 There were magnificent views of the ocean from the roof, living areas, and almost every bedroom. The only drawback was that the city of Oceanside had decided not to replenish the sand on the beaches (which apparently they had been doing in previous years) so there was no sand between the seawall and the water and no safe way down the rocks. So we ended up having to drive to a public beach to be in the water. We still enjoyed our stay though and if you just want the view but not access, this is the place. We truly loved the experience of staying in this house. The views are amazing! The Beachfront Only staff, like Nanci, were great! One advantage is some family members were in the house, while some were on the beach. Be ready for lots of stairs! Washer/dryer on each level is nice! Getting in: We had a code to open the garage door, but we did not have an entry door code from the garage into the house. The property manager was quick to get us the code, but it did not work right away. We finally got in, but it took a while, so make sure you have codes to all entrances into the house. Appearance/towels/condition: the house was clean and welcoming. Towels were folded and ready on each bed. We had a wash rag, and bath towel, but no hand towels, not sure if we should have had hand towels. But we had plenty towels. 4 star rating on general overall condition because we had a screen sliding door that came off the rails and a few other things, but the property mgrs are quick to fix things up. The kitchen is well stocked for cooking/plates/utensils, etc, we should've brought some tupperware or more baggies/foil; along with paper plates and cups so we didn't have to do dishes all the time. If we needed more of anything, like dishwasher soap, the mgrs were quick to help. Beach: we got lucky because we had some time on the beach with low tide so check the tide charts for your trip. If it is high tide, you can hardly be on the beach. Getting to the beach is very difficult. You need to be a Billy Goat to scale the rock path. You'll need your own cooler. It was quite a bit of work to get everything and everyone up and down to the beach, but we managed. Concierge: the Key Concierge service is awesome! They took care of our rentals & pre-stocked our kitchen with our food order. The house was beautiful and spacious. There were 29 of us including children and there was plenty of room. We all had a wonderful time being together. The kitchen was also large so we could cook meals with no problems. We enjoyed the game room and spas and the fabulous views of the ocean. There were plenty of washers and dryers to meet our loads of laundry and the extra refrigerator came in handy. There were only a few disappointments. We had been told there was a fire pit but there ended up being 2 gas "bowls". We had also hoped for better ocean access for the kids to play right at the house. The area next to the ocean was only available when the tide was out for a short time. There was sand in the "yard" to play in but the kids wanted the beach. There was a public beach not far from the house and also one we could drive to that was a few blocks away and we enjoyed both of those. We could have used a little more cupboard space for food storage but the cupboards were well stocked with dishes and cooking utensils and pans. We got by fine. Overall, we loved every minute of it. We went to San Diego and to Universal Studios and Legoland. The traffic is horrific. Plan plenty of travel time. We would love to stay again. It will always be one of our fond memories. We were very pleased with every aspect of the place. very clean, beautifully decorated, everything we needed was available. Wow! Family of 30 mixed ages from 2 months to 65!!! Everyone was in awe! I would absolutely recommend this property to anyone looking for a beach house experience for a larger group. We had 18 family members staying at the house and were easily able to accommodate everyone comfortably. The house was beautiful and the location was perfect. Within walking distance to the pier. The only issue we had were some overly interested neighbors who don't appreciate having rental property in their area. The management company was easy to work with and always responsive. Our home was in a beautiful location and the layout of the house was situated beautifully for our large group of 21. We could be easily together as a group or in different parts of the house in more intimate settings. We enjoyed our stay. We did find the kitchen not well supplied for large groups, or any real cooking that needed to take place. The are not enough plates or silverware, serving dishes or small appliances.The pots and pans are old and small. That made it rather challenging to serve and eat as a group without having to do dishes along the way. When we called the management company two times to ask questions we had to leave a message- we always got a fast response via text but it would of been nice to talk to a live concierge. The triple bunk beds are not comfortable to sleep in especially the bottom and middle bunks. And one of the downstairs bedrooms has a glass door with no curtain so the occupants never had privacy or even darkness in the evening. This could be easily remedied with a curtain. Finally the hot tubs do not heat up very well. We loved the home and the location but the house was INCREDIBLY expensive, and for the price we paid we expected a 5 star rental experience which means the house would of been fully stocked and prepared for the large groups that would rent it. The rental experience was very seamless. The house was exactly as shown and described on the website. It was great that Beachfront Only provided towels for the group too. It was the perfect location for our extended weekend gathering. We had the most amazing time at this house!! We had 16 women and we all had enough space to spend the weekend without feeling over crowded! The house was beautiful and clean and the beach just as nice!! We would 100% go back! I searched for a place to hold 35 ish people (our numbers were fluid) and was happy to find this place that said it slept 34 people in beds and 37/38 on couches. We ended up having 31 people stay for the weekend and used all pullout and cot options and STILL didn't have room for 2 people. I'm so confused at how they counted for people to fit in this place! I went back through and counted and we had 2 people sleeping in every king, queen and full (which is kind of tight in a full) and we still didn't have enough room. Do they think people will squeeze 3 to a king?!? One of the cots didn't have a mattress on it and two people made a bed out of the leftover cushions from the couch pullouts. If we got a good deal on this place I would have just said oh well, but to pay almost $5,000 for a weekend and not even get what was advertised is ridiculous. Also even if we only had 29 people, the cooking supplies were too small to cook for that large of a group. Thankfully some people lived close by and I had them run home for pots, pans and cutting boards. It would be nice to know how small the pots and pans were so I couldv'e picked some up from smart & final or brought them from home. Overall the setting is what truly makes this place, so if that's what you're looking for then this is an awesome place!! We especially loved the 3 hot tubs (the pool heats up to hot tub temp!!)!! If you're planning a family vacation then be prepared to eat out a lot or bring your own cooking supplies. This house was phenomenal. 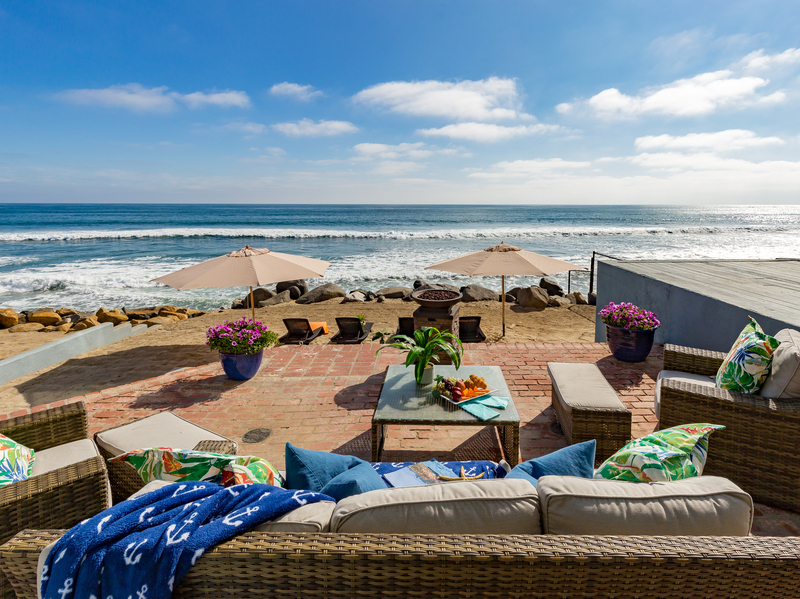 2 hot tubs, 1 large hot pool, oceanfront property with a surf break out front. Can you ask for anything better? Our stay was great. The house slept 11 men more than comfortably, and the space provided amazing sunsets on the roof, poker night on the mid deck. And sun bathing on the beach. I would highly recommend this house and beachfront only to anyone looking for a 5 Star expierence. Thank you!! The beach house we rented for our family stay for 6 days was absolutely perfect! Everything was pristine, truly we loved every minute of this home! The location, the private beach, the pool, the hot tubs, the great space for us all! We all want to return to this amazing home! Over all experience 10+ stars! If I could give 1,000 Stars I would. This place was truly amazing-I mean truly. We had a life celebration for the most amazing woman ever & this place was the most perfect spot!! Adequately stocked with the most comfortable beds ever. We all slept sooooo good and to be able to wake up to 180’ views of the water is just breathtaking. Plenty of linens, towels, dish ware, cookware were all noted. *maybe see if the city of Oceanside could provide two more trash bins as the first filled up quickly & we hated just leaving he trash bags on the garage floor. 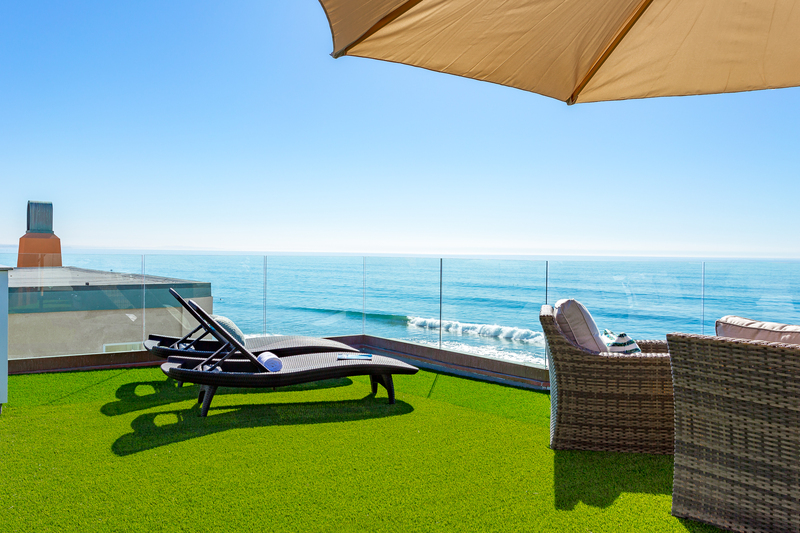 Beautiful Location and Amazing Roof Top in Oceanside!!! We had a wonderful stay with this property. Great location and the grassy Roof top is outstanding feature. There was only 6 of us for Easter weekend however this property would be ideal for multi families with lots of kids. It as a big kitchen, lots of rooms with bunk beds and 2 separate spas (one on the roof top and other on the beach level). Unfortunately the pool was not working during our stay but that would be an amazing feature if possible! Hopefully they are able to get that to work out and we will be back!!! The property itself was wonderful. The rooms were spacious and clean. The rooftop was a hit! 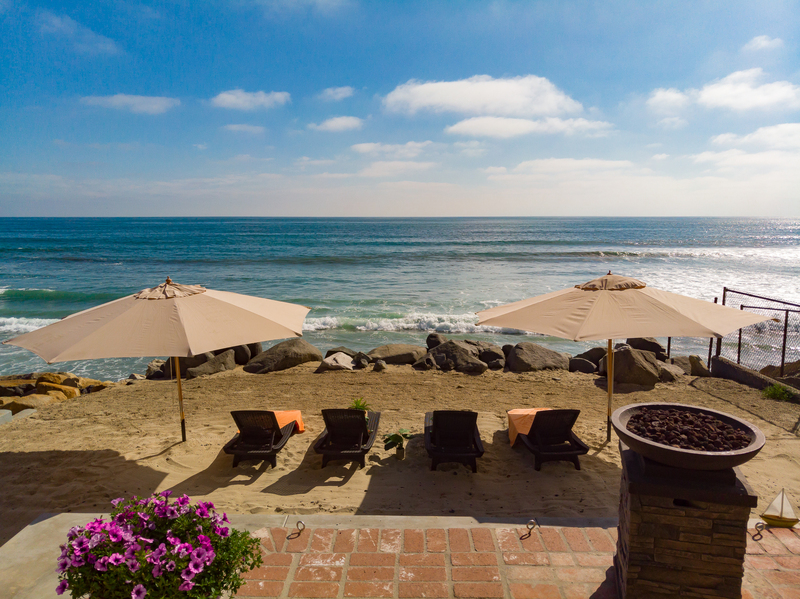 The spa was thoroughly enjoyed and it made for a great place to lounge and take in the ocean views. Our guests were greatly impressed and loved the property--we never left it! However, what left much to be desired was the interaction with the management company before arrival. The first disappointment was that I had reserved a listing and after I had filled out the contract and submitted, they rejected it, saying that someone just booked it before me. They offered me no solution and it left me scrambling to find another property that would accommodate my 25 guests. Since there was no inventory, I had to change the date in order to find a rental that would fit all of us. After the second signing of the contract was complete on 4/8 and nearly two weeks later, I received an email stating that the pool was no longer available. I asked for some sort of concession since that was one of the key features in why we booked, but Nanci from the management office stated that it was never advertised as they had removed the photos from the site on 3/12. I had told Nanci that was incorrect as I saw the pool in photo library of the listing, in the 3D video and in the Hospitality app photo library (they have yet to update it still). As we were going back and forth via email, the response I keep getting from Nanci was “You may cancel your reservation for a full refund, just let us know asap.” I received no apology, no alternatives/solutions and they didn’t recognize that it was their error. I felt stuck, knowing that our trip was less than two weeks away and I didn’t have time to go with another rental company. I didn’t want to continue to fight the battle, fearing that they would cancel my reservation again. I didn’t appreciate how I was treated, nor that they valued me as a customer who was spending nearly $5K for a rental.